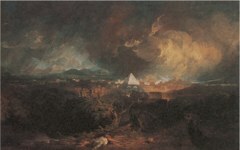 In the entry on Turner's Fifth Plague of Egypt (1800) I noted Simon Schama's passing observation that many of Turner's paintings include eye-shapes. 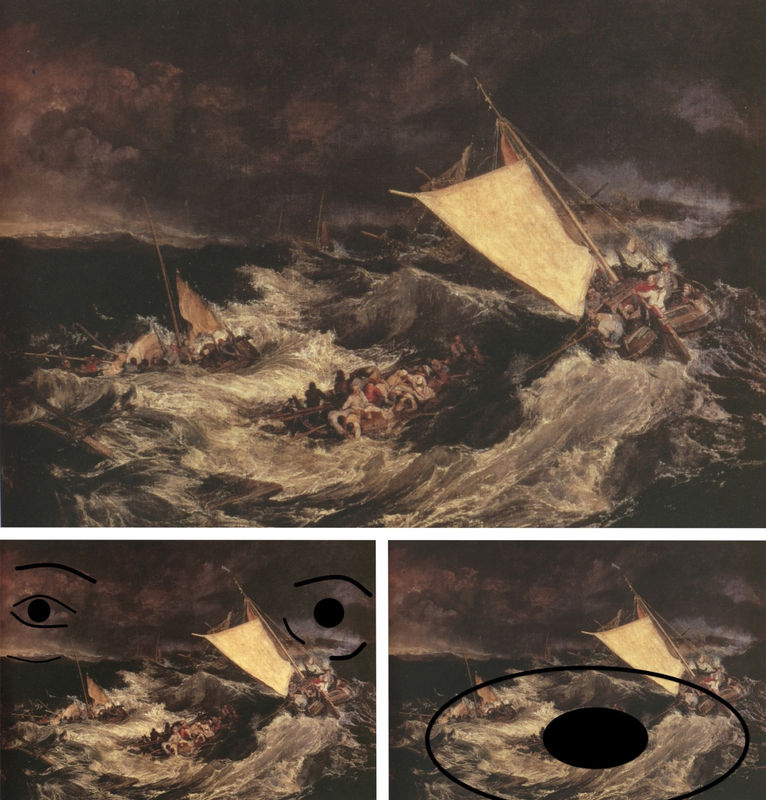 What he does not recognize is that they are eye-shaped for a reason: the viewer is situated behind Turner's own eyes (bottom) and inside his mind. In this example, though, there are multiple eyes including his inner one, the eye of imagination. Top: Turner, The Shipwreck (1805) Oil on canvas. Tate Britain. Bottom: Detail of Turner's Self-portrait (c.1798 - 1800) Oil on canvas. Tate Britain. The diagram (lower left) shows a pair of eyes in the sky, one larger than the other but with pupils identified. The other (lower right) shows the foreground dory in the eye of the storm, literally, to represent his inner eye. The seafoam around conjures up the white of the eye. Beyond that the wine-dark sea takes on the color of the darkened sky. 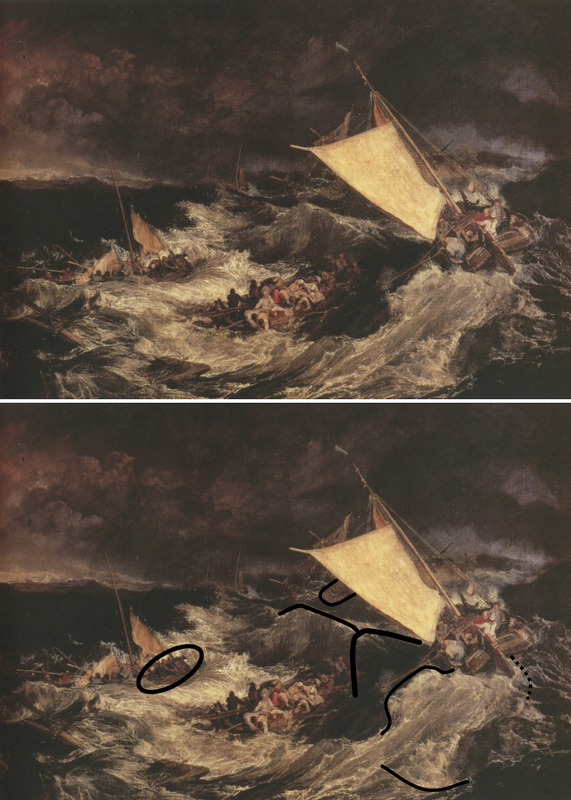 We are deep inside Turner's mind in stormy waters. Normally the inner eye is above "real" eyes but at this point Turner seems to suggest that his creativity stems from dark mental chaos below and is not solely enlightened from above. Chaos like the subconscious jumbles ideas together to create new ones. He may be having it both ways though as we will see. But there are still more eyes. Indeed a whole face - eyes, nose, philtrum and the suggestion of a mouth - emerging from the waters of the deep and facing upwards towards the sky. Another small vessel is at the center of its right eye while the far one is the stern of the sinking ship mostly obscured by the bright sail. One is open for out-sight, the other covered for insight. As in Monet's seascape, Au Bord du Fjord, près Christiania (1895), the "face" looks upwards and, like Monet's again, it surely represents Turner's own. Like all art on EPPH, we are inside the artist's mind which, being universal, is ours too. What painting, then, is this mind conceiving? And the answer is: the principal boat sailing along Turner's far "cheek". That is the picture's principal motif and the "painting" in the painting. The vessel's sail is, of course, canvas and, like an artist starting a new one, it is blank. The canvas is also angled as on an easel, the light striking full force as if in a studio. The boat and that bright sail are just outside the largest "eye", that "eye" of mental chaos in the lower half of The Shipwreck. 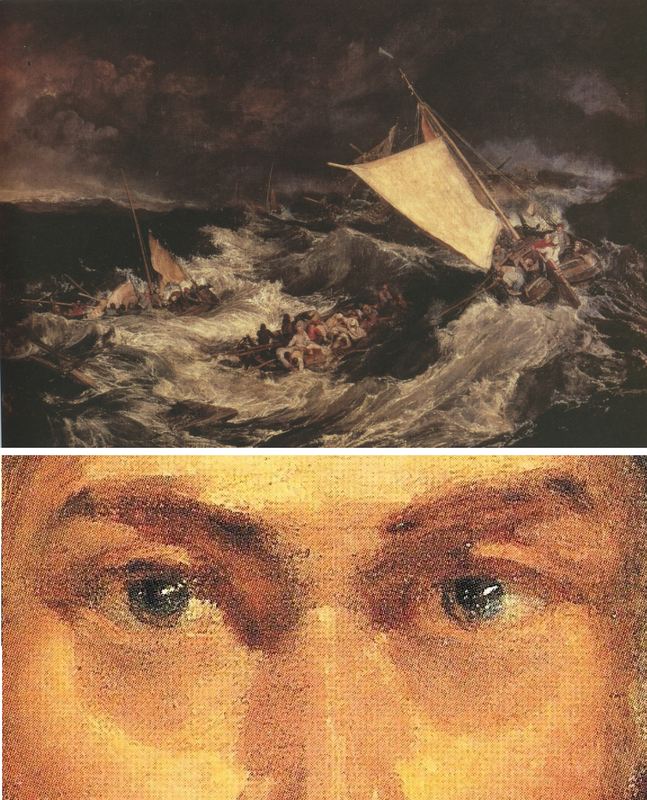 Whether coincidence or not, Turner's forehead is the brightest part of his self-portrait too and close in color to the sail (bottom). Indeed, in this view, the tall wave in between the boat and "eye" below, though it delineates the ridge of his "nose" in the upturned face, also mimics the shape of his eyebrow. (These multiple levels of form are normal in art like the poetic use of a pun.) Thus he seems to suggest that his imagination is both, so-to-speak, chthonic and enlightened, from below and above. Naturally, the sailors are "artists" as well, dipping their long, thin wooden oars into the raging sea like long, thin, wooden "brushes" in liquid paint. 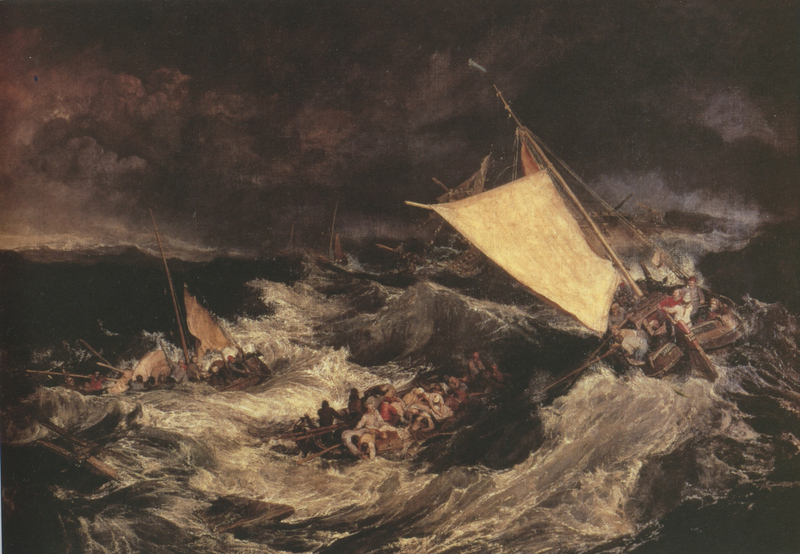 Thus the storm and struggle for survival are Turner's creative struggle in himself which can lead to an incomparable masterpiece or abject failure. As the sailors know, there is no middle ground in the struggle to survive, in art or at sea. He also portrays the creative process, which is one path to self-knowledge, and how imagination comes from both enlightenment above and from the mysteries of the deep below. Turner, The Shipwreck (1805) Oil on canvas. Tate Britain. 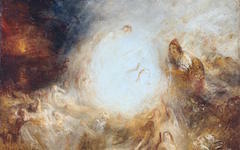 And for more on Turner's hidden visions, see our post on The Poetry of Turner's Eyesight. 1. The dark skin around Turner's eyes appears in both extant self-portraits. Original Publication Date on EPPH: 12 Jun 2012. © Simon Abrahams. Articles on this site are the copyright of Simon Abrahams. To use copyrighted material in print or other media for purposes beyond 'fair use', you must obtain permission from the copyright owner. Websites may link to this page without permission (please do) but may not reproduce the material on their own site without crediting Simon Abrahams and EPPH.